SQLpie - A sleek API platform for intelligence prototyping. SQLpie : A sleek API platform for intelligence prototyping. Simple, open source, and built to last. 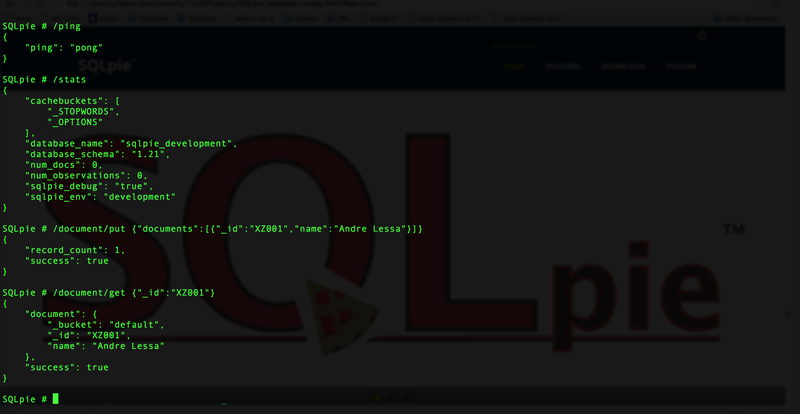 SQLpie is a JSON API. It's 100% written in Python 2.x, and it was designed to sit on top of a standard MySQL database. After setting up the SQLpie server, you can place direct API calls, use the provided SQLpie shell utility, or import the SQLpie client library. A sleek API platform for intelligence prototyping. SQLpie™ is a simple, intuitive, and powerful API platform for prototyping projects that require data intelligence features. Store your application's JSON documents in your existing SQL database. Throw a curveball in the NoSQL game. Use SQLpie as the backbone for your new idea so you can quickly get a prototype out the door. It's Open Source, MIT License. Get involved! If you come across any improvements, bugs or feature requests, please send me your feedback. If you want to dive into the project, the documentation and tests are the best place to start, of course. There's still a lot that can be done and/or documented... so keep an eye out for updates. Hi, I'm André Lessa. I've been working with Python and SQL since the mid-to-late 90s. In 2011, I started working on SQLpie when I had an idea to provide intelligence as a service. At that time, I conceptualized a simple API framework capable of managing information, and performing a lot of intelligent/information-retrieval/machine-learning tasks. With that idea in mind I spent a good part of that fall/winter and most of 2012 fully focused on the project. I pitched such API framework to a startup accelerator in the summer of '12 but didn't get in with that particular idea (I ended up getting in 6 months later with a more comprehensive, competitive intelligence, product in 2013, but that's another story). Fast forward to 2016, I am now open sourcing this codebase and sharing it with the world as I believe this framework has the potential to help others.